I’ll be the first to admit that my trip reports are about as far they could possibly be from being classified as “educational”, and I don’t think I’ve ever written an article here on sanspotter.com which would make someone instinctively reach for a notepad to scribble down valuable pieces of information as they read. It isn’t like I don’t have any desire to teach and inform or anything, but my writing style always gravitates towards making silly jokes about things like red shoes and Healthwhiches (leaving little mental energy left over to be serious and adult-like), and I just can’t help it. But today is your lucky day my friends! 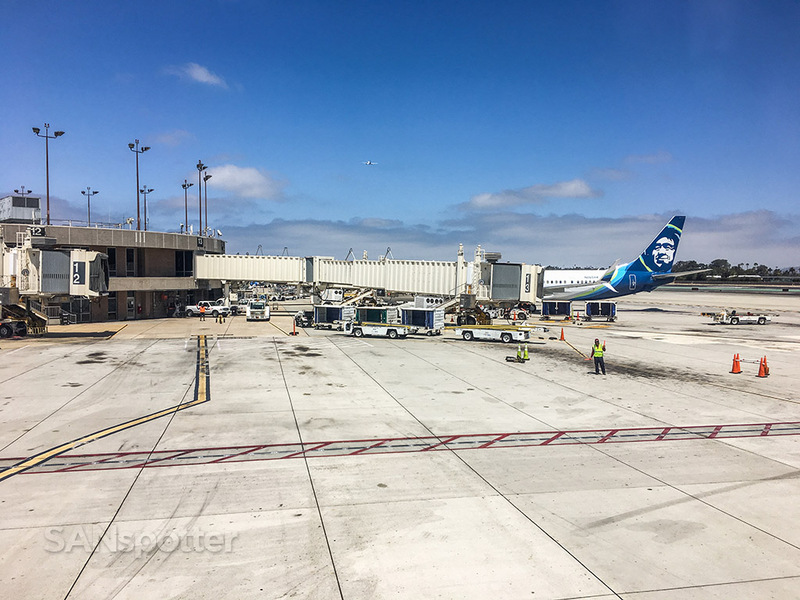 Grab your notebook and something to write with, because this Austin to San Diego trip report contains a valuable life lesson which can potentially save you heaps of embarrassment and frustration as you arrive at the airport to check in for your flight. Frontier Airlines A320 (N235FR) side view illustration by norebbo.com. Pike the Otter doing the honors today! 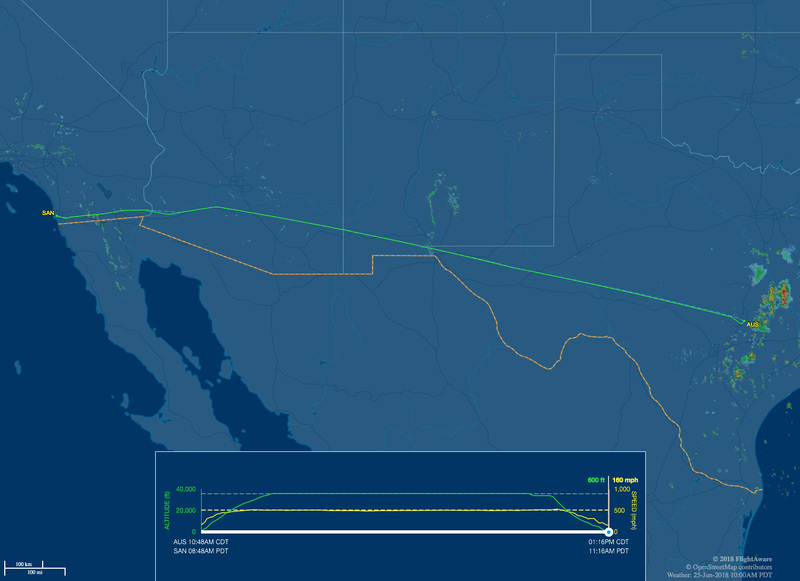 Seat map of this Frontier Airlines A320 (courtesy of seatguru.com) showing my seat (3F) for this flight to SAN. 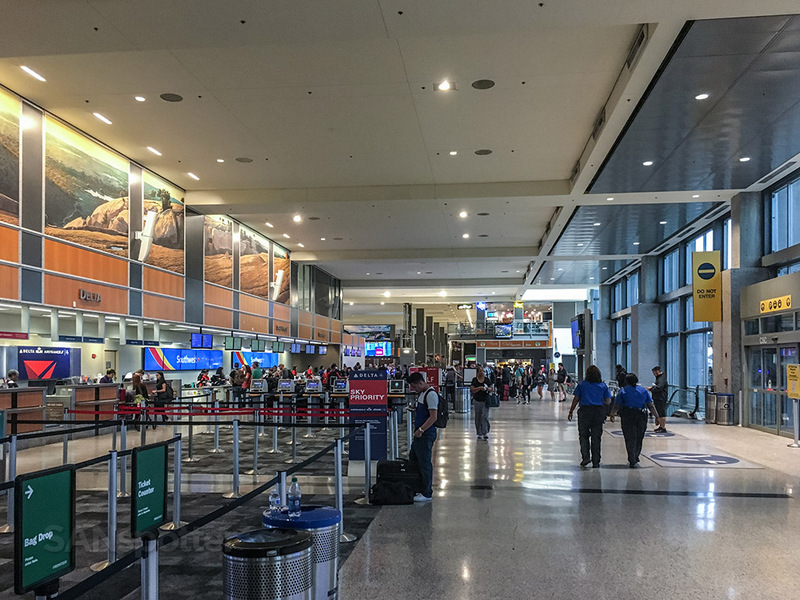 This trip report begins on a dark and rainy Monday morning on a second-floor room at the Hilton adjacent to the Austin Bergstrom Airport. It’s 5:30 AM, and your hero (that’s me BTW) is shuffling out of bed with arms pointing straight out in front of him like a zombie trying to find the source of the piercing alarm which has woken him so violently from his zombie-like slumber. There’s a shuttle bus leaving for the airport at 6 AM, and his goal is to be on it. Let’s get going! Never (and I do mean never) trust your hotel shuttle bus driver! Hmm. Perhaps you were expecting something a bit more meaty than that? It does seem a bit anti-climatic, I know, but trust me on this. These people are not your friends, even if they look like happy / seasoned pros who have been on the job for 30+ years. Are you writing this down? He seemed like a nice enough guy, greeting me with a smile as I stepped onboard, and asking me which airline I was flying this morning. 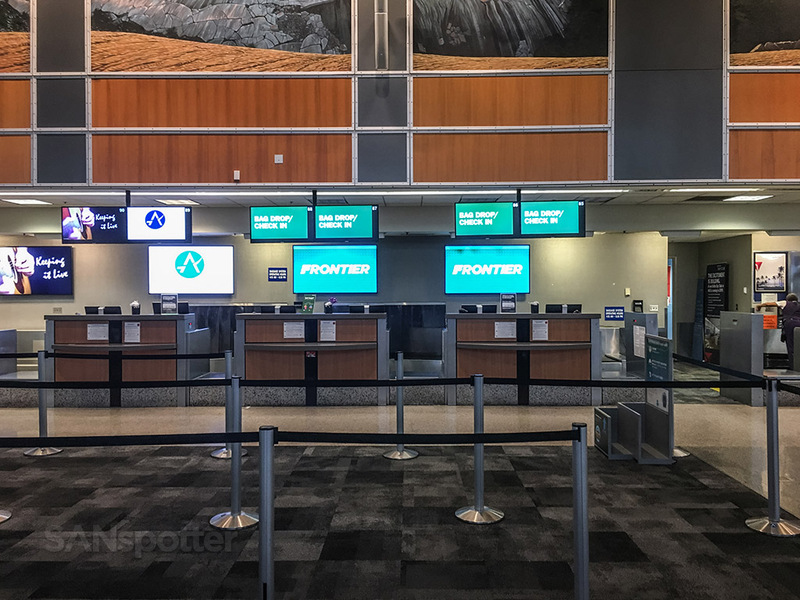 “Frontier please”, I replied, not expecting anything else than being dropped off in front of the Frontier Airlines baggage drop sometime within the next 10 minutes. That seemed like a fair enough assumption, right? And right up to the point where we pulled up to the airport, things seemed to be going just as planned. “Frontier departs from the South terminal” he said as I was stepping off the bus, followed with instructions on how to get there. “You see that bus stop 200 feet ahead? 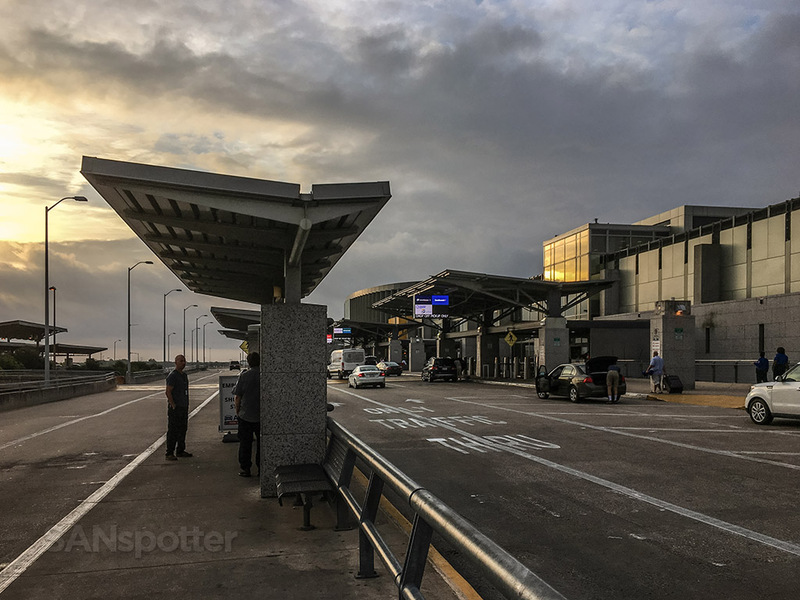 Just wait there and there will be another shuttle bus that will take you over to the South terminal in just a few minutes”. I thanked him for his help and walked down to said bus stop to wait for my ride. It’s stupidly hot in Texas, even at 6:15 AM under overcast skies with a bit of drizzle coming down. Just one more shuttle bus ride to go, and I’ll be safely indoors basking in glorious air-conditioned comfort! 25 minutes later, I was still waiting. 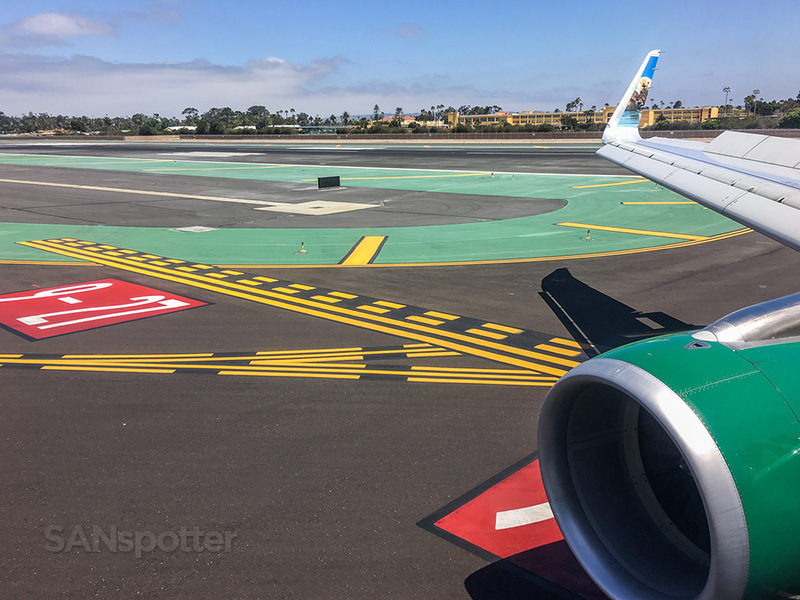 I was seriously considering grabbing a taxi at that point, never even considering for a moment that I was actually in the right place and that the Frontier Airlines baggage drop was just 50 feet behind me. 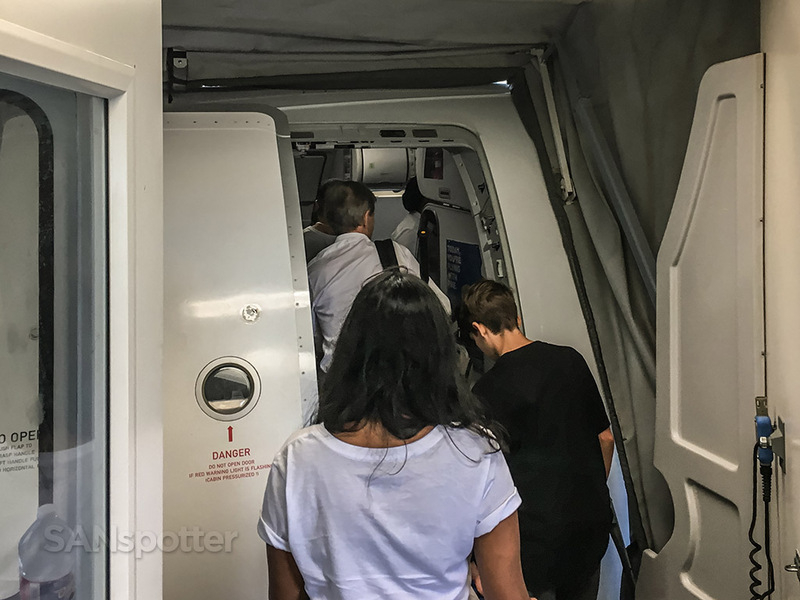 That’s right ladies and gentlemen – I had been given bogus information and I was about to be sent on a wild ride over to the South terminal (a place which just so happens to be nowhere near the North terminal – or even the airport for that matter). Heck, it might as well have been located across the state line in Louisiana, because once the shuttle bus did arrive to scoop me up, it was another long 25 minute ride over there. Where the hell is this guy taking me? After 20 minutes of driving with the airport nowhere in sight, I was starting to get worried. 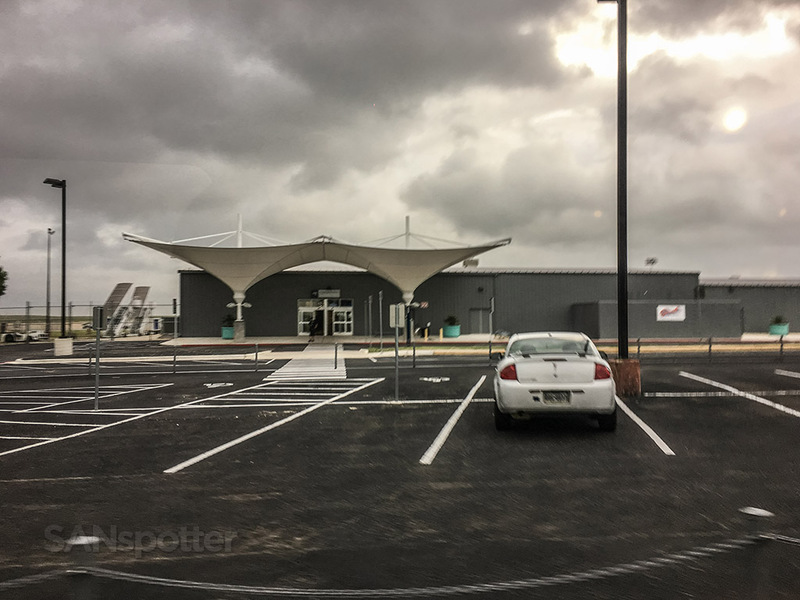 Once we pulled up to what looked like a series of temporary buildings clustered together out in the middle of nowhere, it dawned on me that I had been led astray and that Frontier Airlines did indeed depart from the North terminal (where I had been dropped off originally). Dang it. Thankfully I have a habit of arriving at the airport stupidly early every time I fly, because I wasted an entire hour unnecessarily shuffling between terminals this morning. Even though I was in no danger of missing my flight, it was still rather embarrassing and not the best way to start a day of travel. 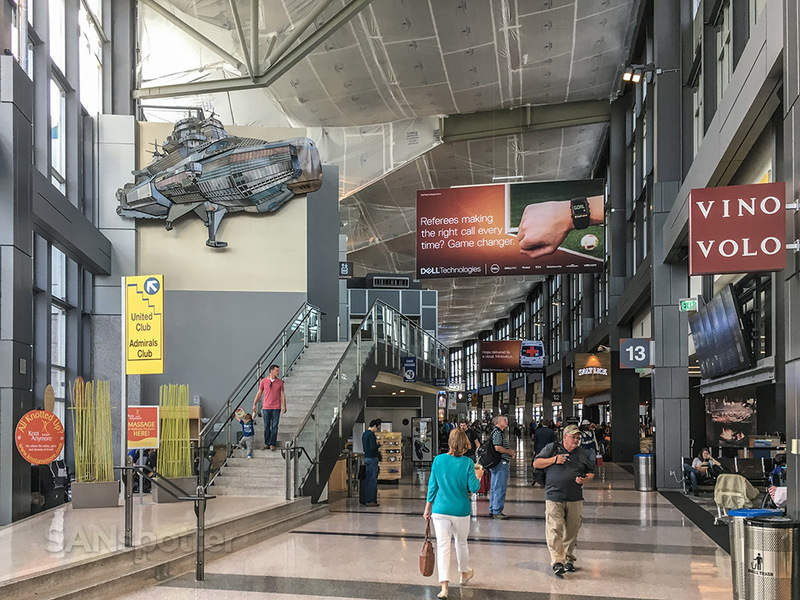 Welcome to the South terminal at Austin Bergstrom Airport! Unfortunately, Frontier Airlines does not depart from here. 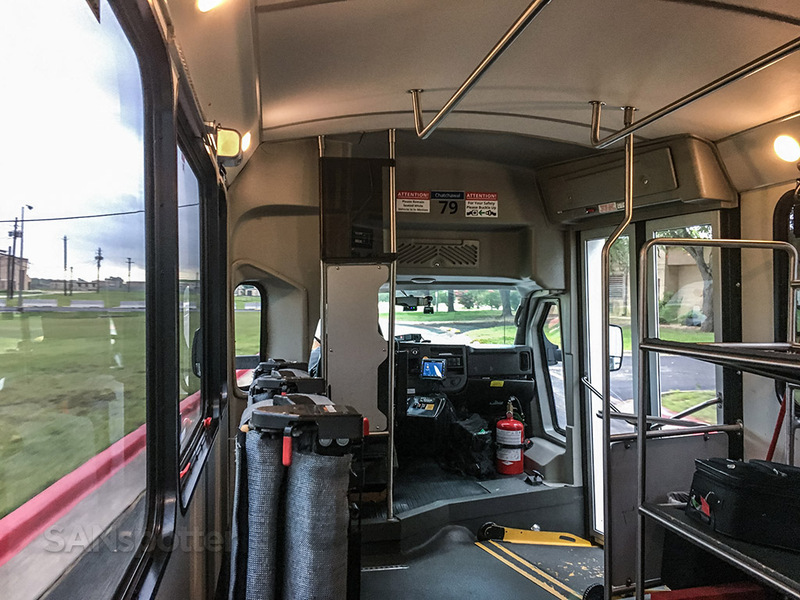 Have you any idea how embarrassing it is to ask your shuttle bus driver for a ride back to the place where he just picked you up from? 25 minutes later, I arrive back at the North terminal just 50 feet from where I was standing 50 minutes earlier. 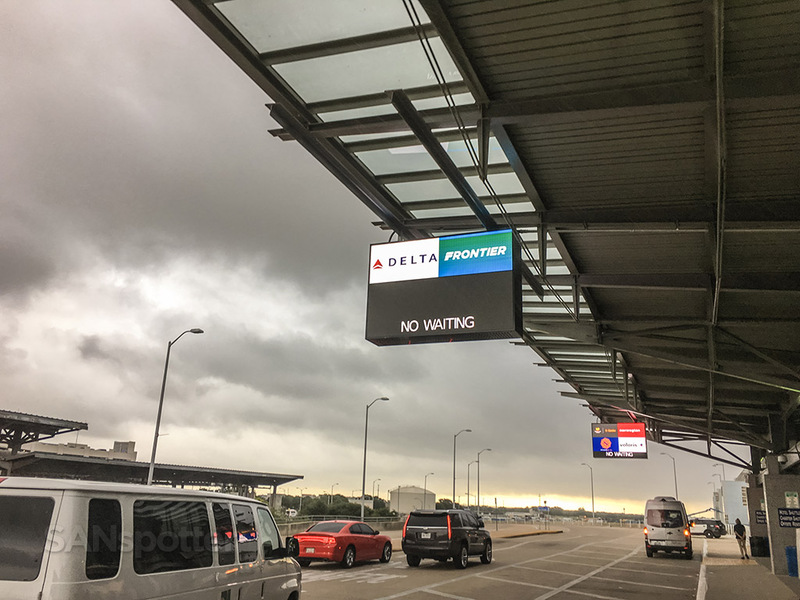 That sign taunting me with a “NO WAITING” message was the icing on the cake. Well, would you look at that? Despite having been shuttled to Louisiana and back this morning, I was still so early that the check in counter wasn’t even open yet. I’m telling you, my “getting to the airport with plenty of time to spare” skills are ninja-like. Heck, I’m actually so early that it looks as if I could be first in line at Delta too! Once through security, I was thankful that I still had about an hour and a half to go before boarding was scheduled to begin. That gave me ample time to grab a bite to eat, and to berate myself a little for not paying attention and knowing ahead of time which terminal that I needed to be at this morning. I had definitely learned a lesson, and felt a little excited that I actually had something educational to share on the blog for once. 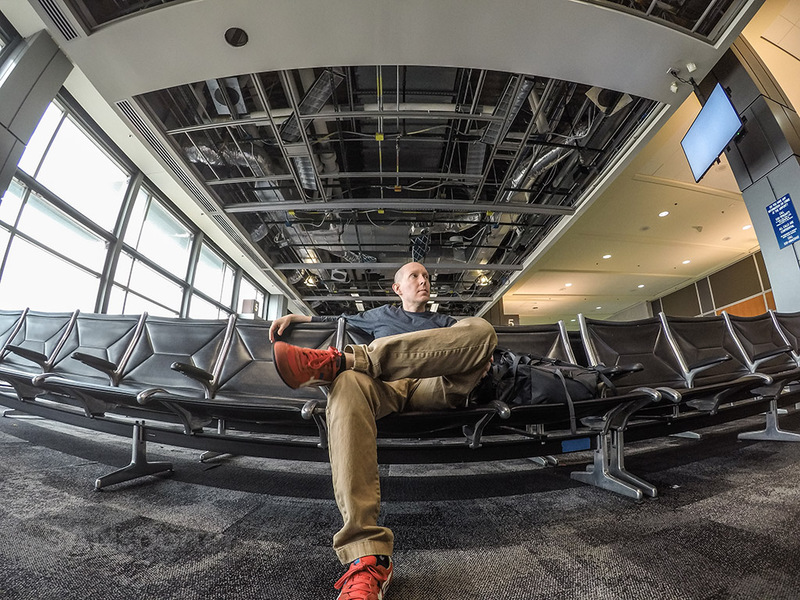 How come nobody ever told me that this was such a cool airport? I totally expected seeing Dell ads everywhere, but I wasn’t expecting them to be hanging in such a large and good-looking building! Trying to look calm, cool, and collected is really hard when you know that you were dumb enough to have been sent around on a whirlwind shuttle bus adventure (one that could’ve been completely preventable if you had been paying even the slightest bit of attention). 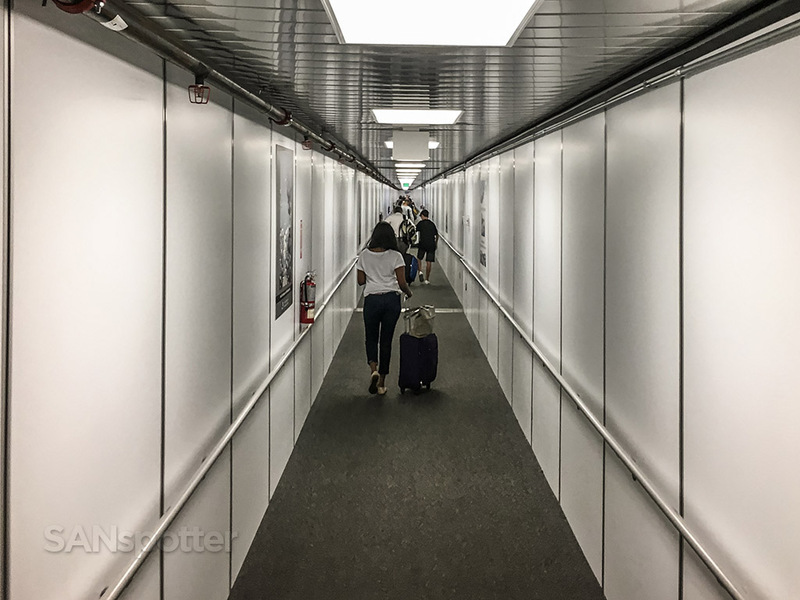 I found it interesting that our gate for this flight to San Diego was the exact same one (with the comically long jet bridge) that we arrived at just two days prior. 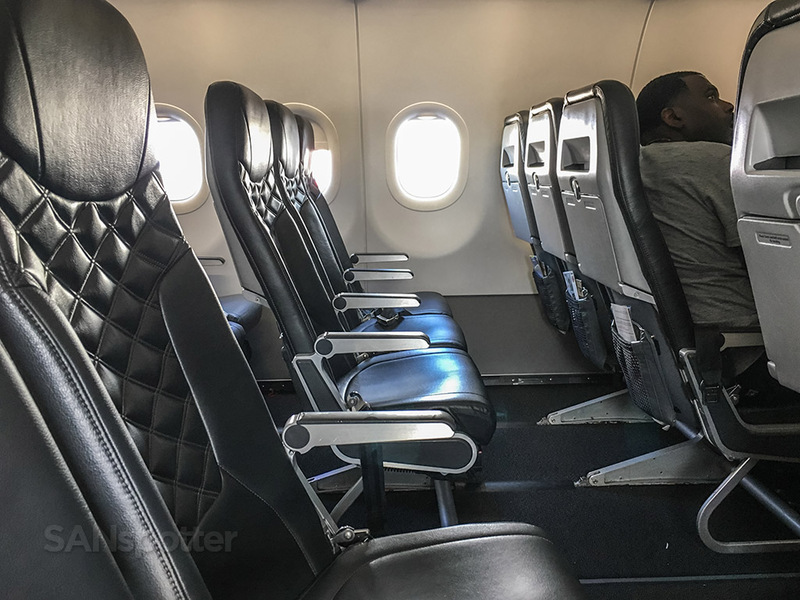 The only difference between this flight and that one was that this was looking to be a little bit of a lighter load, and I was feeling pretty good about the possibility of having an open seat next to me this morning. 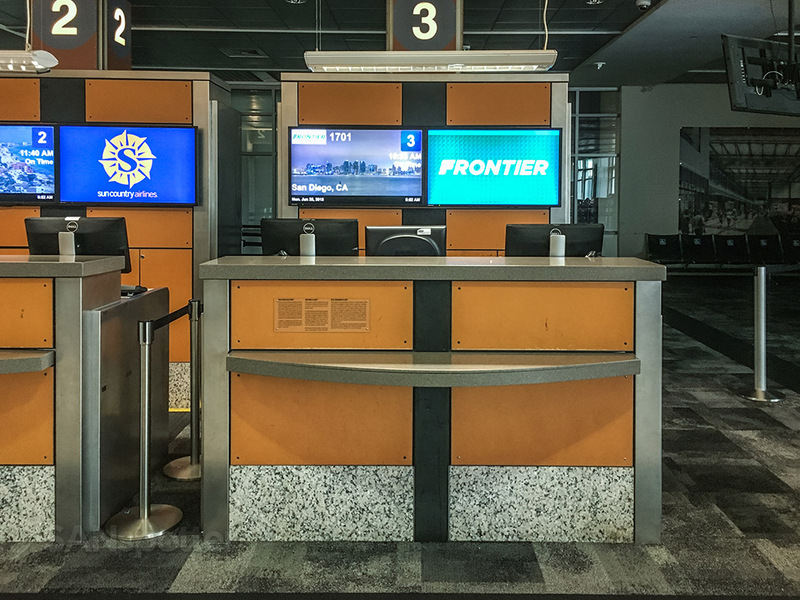 Gate number 3 for the ride home to San Diego this morning, and completely proud of myself of the fact that this was the second picture of a Frontier Airlines desk that I was able to snap this morning that didn’t have anybody in it. Mad photo skills yo! 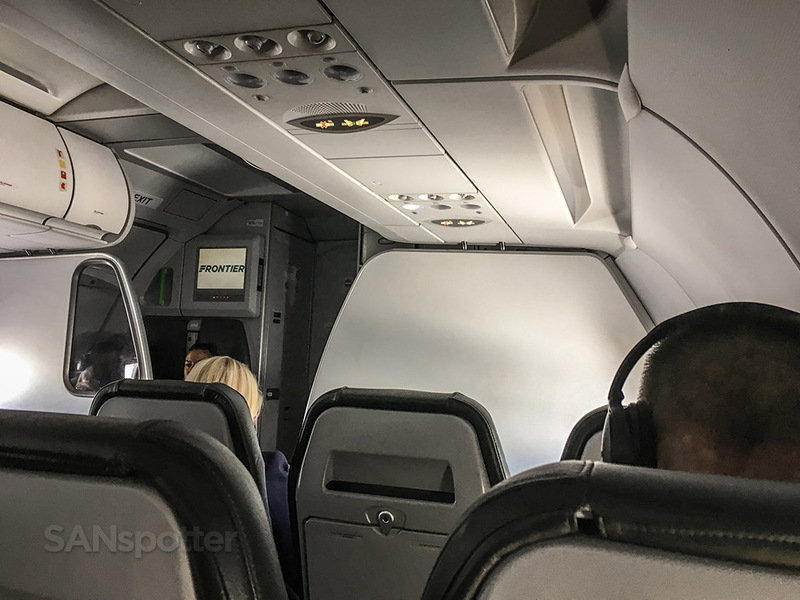 It’s looking like a light load so far – but with my luck, there could be just three other people on the plane and at least one of them would be seated right next to me. It always happens. The battery on my old iPhone 6S doesn’t hold a charge very well anymore, so I hope y’all appreciate the sacrifice it took to fire her up and get this shot. Thankfully nobody passed out during the long walk to the plane. 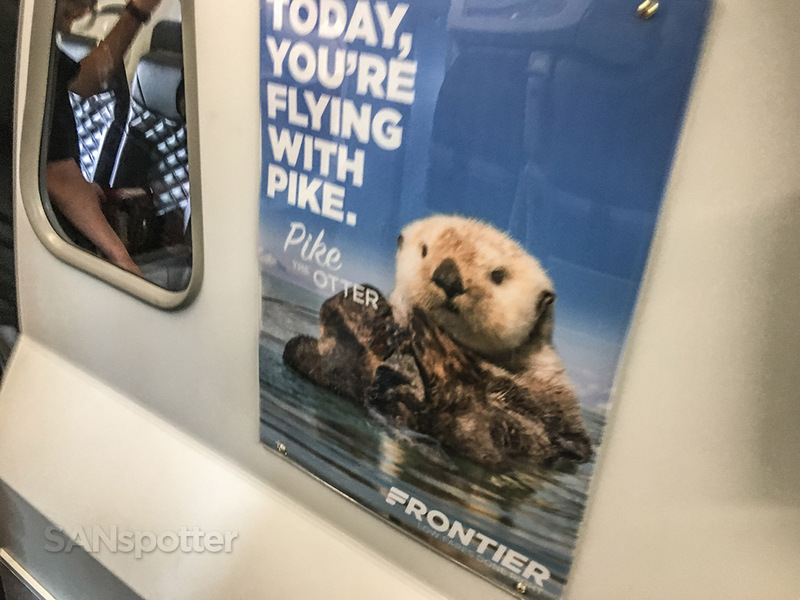 Today we’re flying with Pike. I’m cool with that, as long as his stubby little arms can reach all the controls. 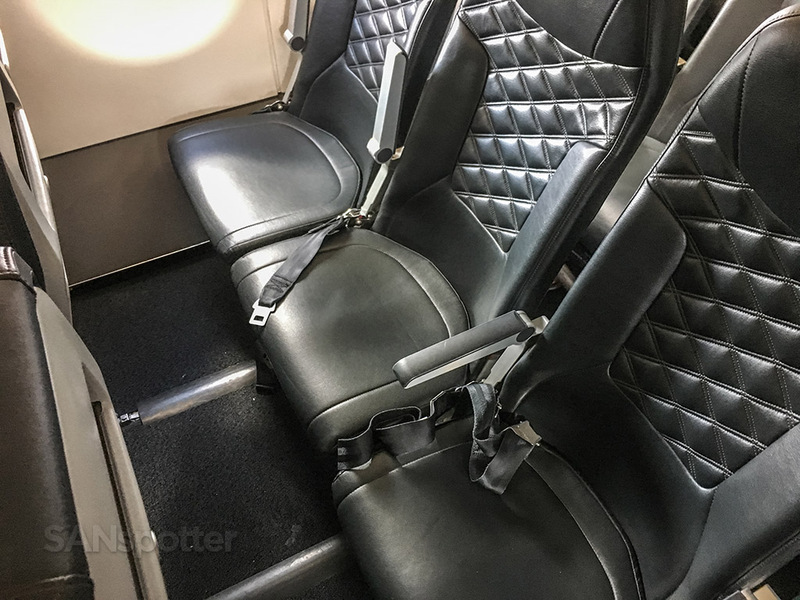 Oh, those glorious Frontier Airlines Stretch seats. Probably the most comfortable (and definitely the best looking) economy class seats I’ve seen in a good long while. 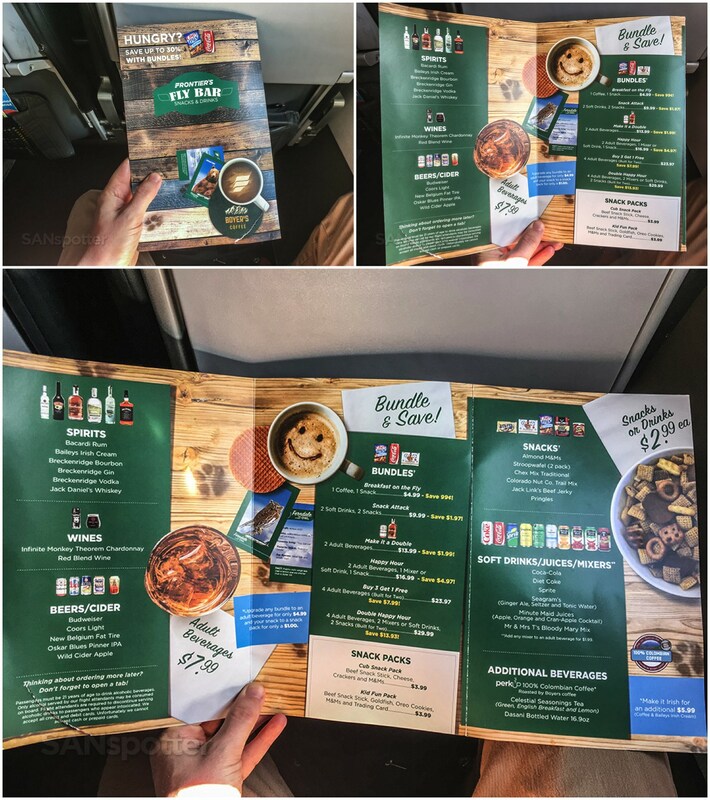 Who would’ve thought that Frontier Airlines would have become even more cool when they switched to an ultra low-cost business model? For comparison’s sake, I don’t recall ever writing the word “cool” once in my Allegiant Air trip report from a few years ago. Huge shout out to Pike for being generous with the leg room up here in row three today. These stretch seats are no joke! 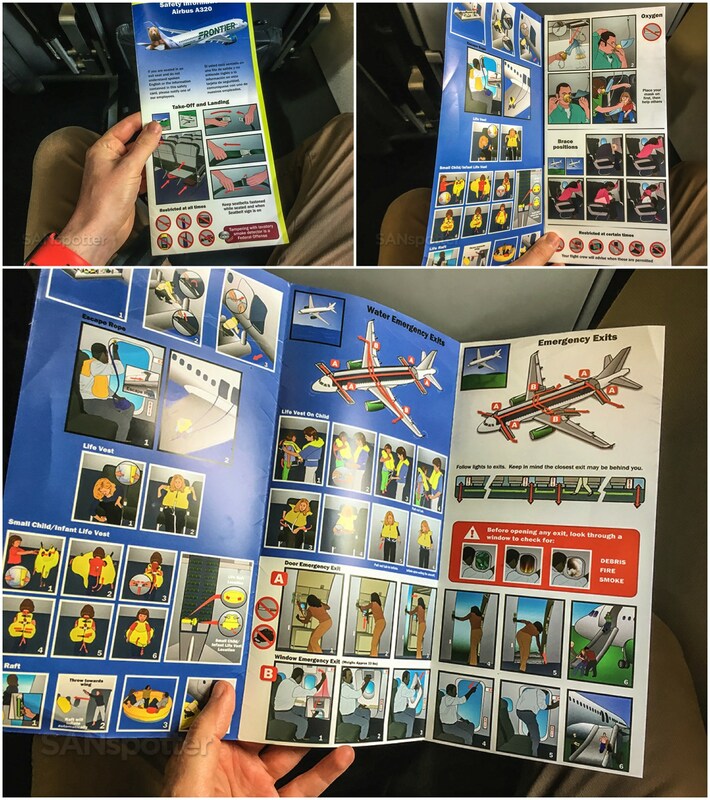 I do believe this is the first time that I ever seen an escape rope being mentioned in the safety card. Either that or they’ve been there all along and I am totally embarrassing myself for even mentioning it. I think it’s funny that for the “Buy 3 Get 1 Free” option, they put a gentle reminder in there that it isn’t intended be consumed by just one person. 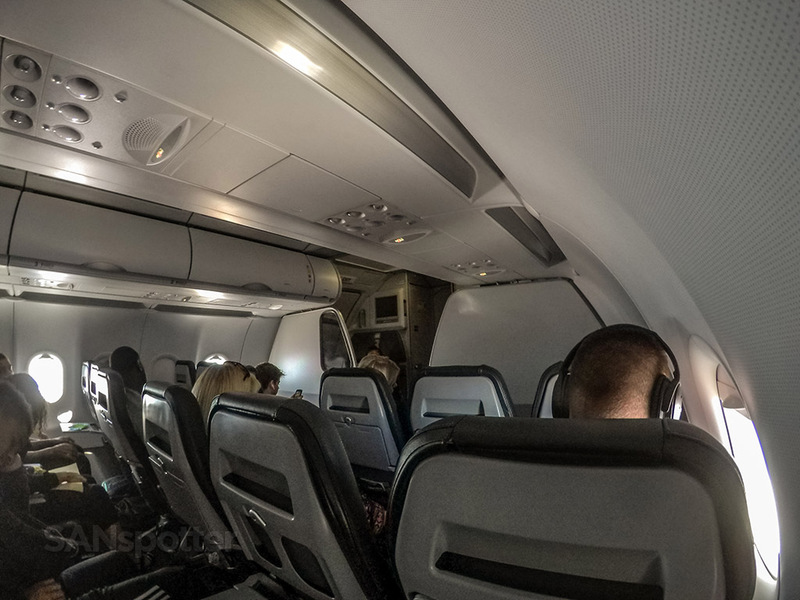 Once onboard with the boarding door closed, the possibility of having an open seat had been confirmed and I was enjoying sitting there with a little bit of extra room to spread out. 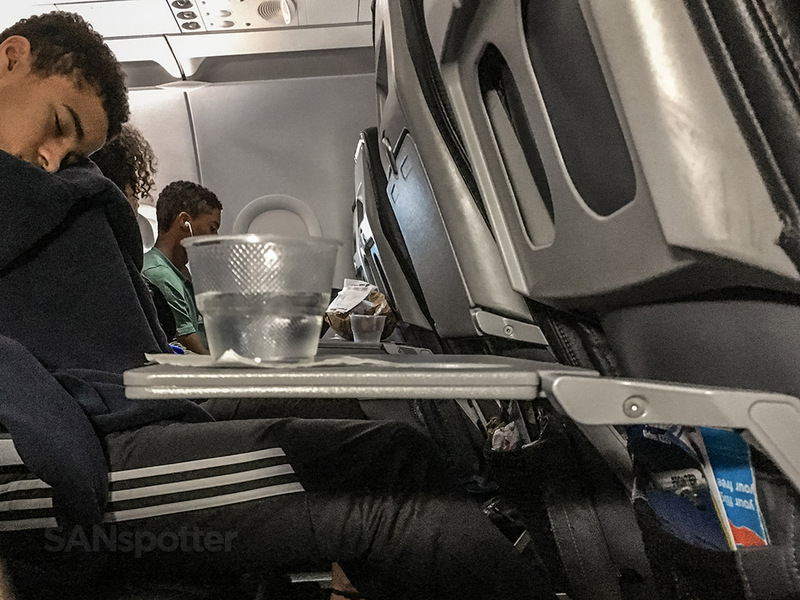 Unfortunately, there was a small child sitting directly behind me, and you know how small kids are with their natural tendency to kick seats. 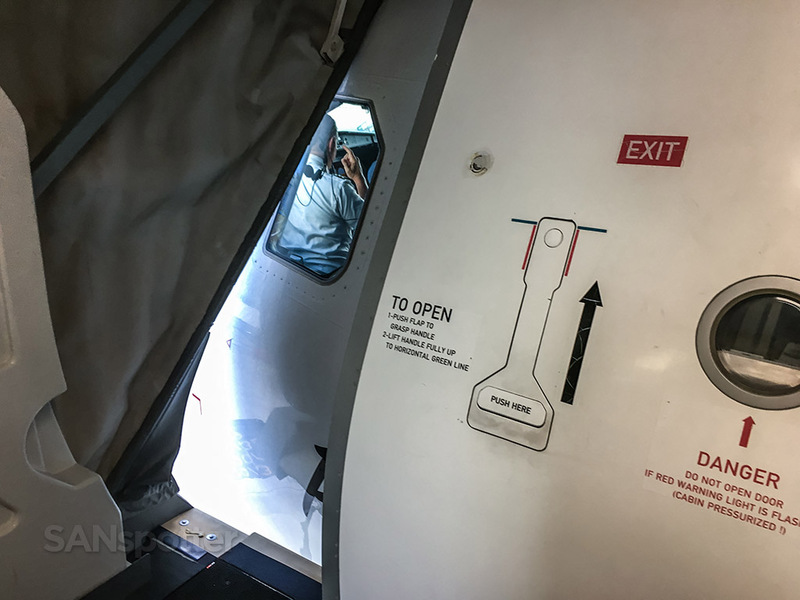 I really thought that I was going to be in for a completely miserable flight, but thankfully the kicking stopped as we pushed off the gate and headed out towards the runway for departure. Disaster averted. Proving once again that no matter where I go in life, the rain always stops and the sun always shines as soon as I leave. Southwest Airlines always seems to follow me around as well. Weird. 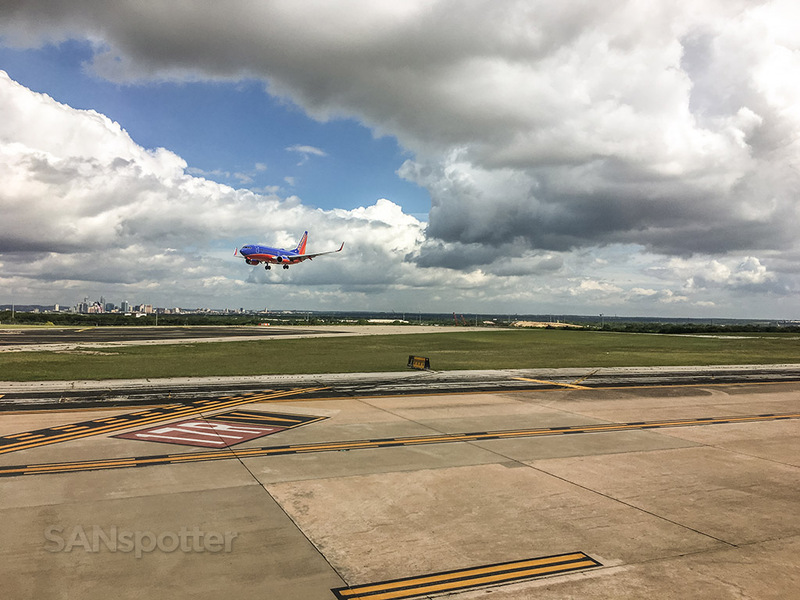 Holding short of 17R, with a very anxious looking Pike out there on the winglet just chompin’ at the bit to fly. Empty middle seats for all of us up here in the first three rows today. 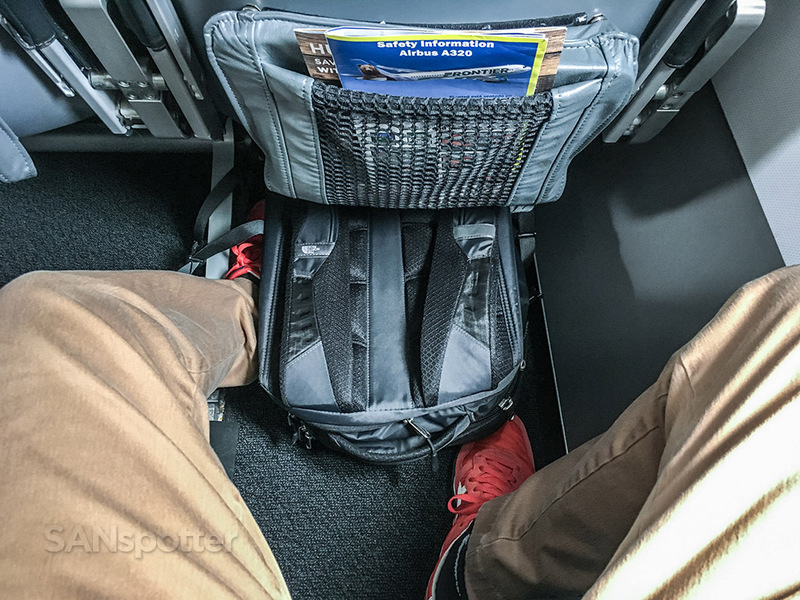 “Stretch” seats are extra special when you have space to stretch out your elbows in addition to your knees! 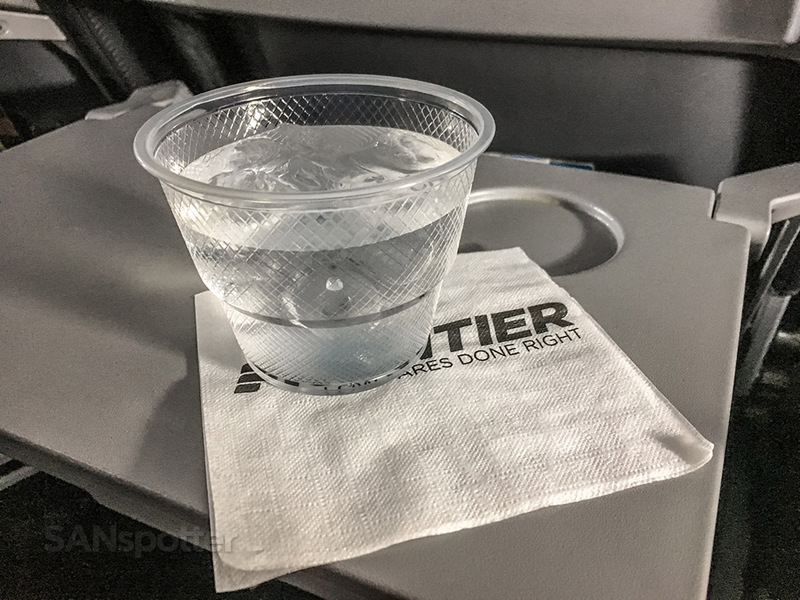 Just as I mentioned in my trip report about the flight to Austin several days ago, nothing is free on Frontier Airlines except for water in a plastic cup, so I took full advantage of that and sipped slowly on that chilly H2O all the way to San Diego. Hey – I’m an expert in milking free things for as long as possible, and I did a number on that cup of water this morning. It was an enjoyable refreshment lasting the entire 2 1/2 hours. Also helping to pass the time on this flight was a bit of trip report writing and podcast listening (as usual). 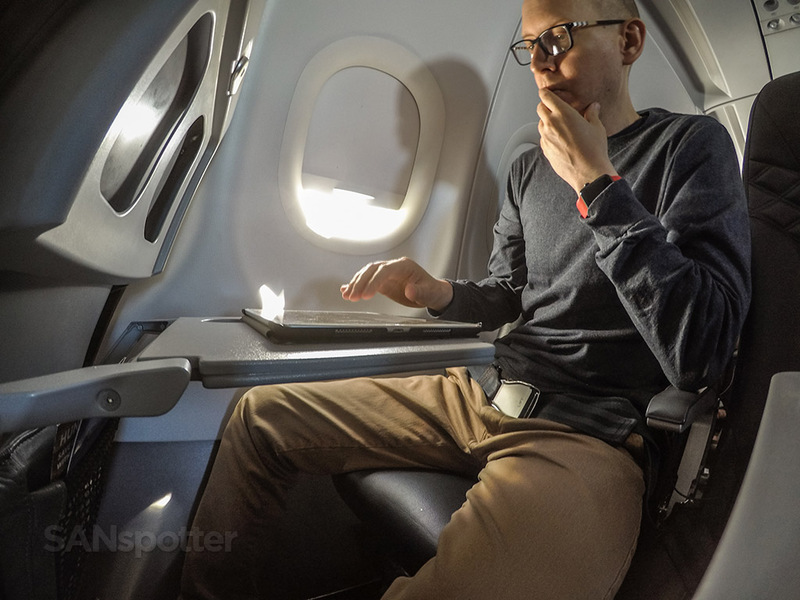 I didn’t even get up to use the lavatory once, and between all the writing, listening, and sipping, the flight went by in a flash. Hard at work on another trip report (trying my best to come up with clever captions for pictures of water in plastic cups probably). Pike looking over my shoulder as I bang out that trip report. Despite what you may have heard, Otters are lousy editors. Podcast mode. Speaking of which, I’ve been having an itch start one of my own. 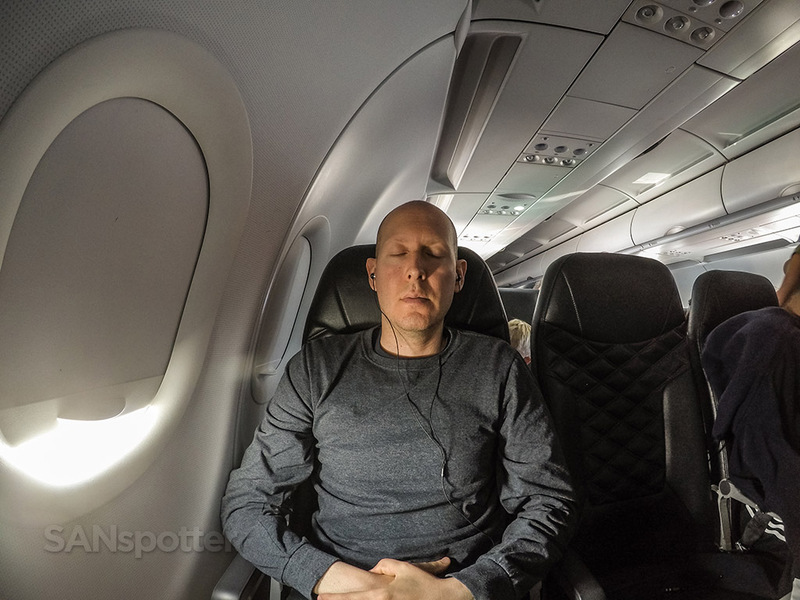 Anyone out there interested in listening to me yammer about travel / aviation / travel blogging topics? Bummer that I didn’t get another ride on a NEO today. 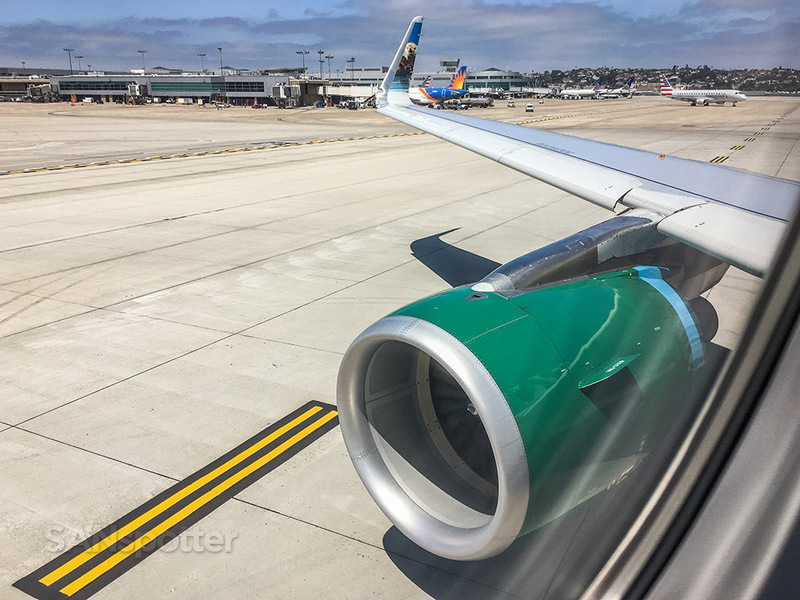 For those that haven’t flown on an A320neo yet, they are so quiet that the only thing that you can hear during cruise like this is wind noise. If old piston pounders and that kind of sound is what you love, you’re definitely not going to like the NEO experience! 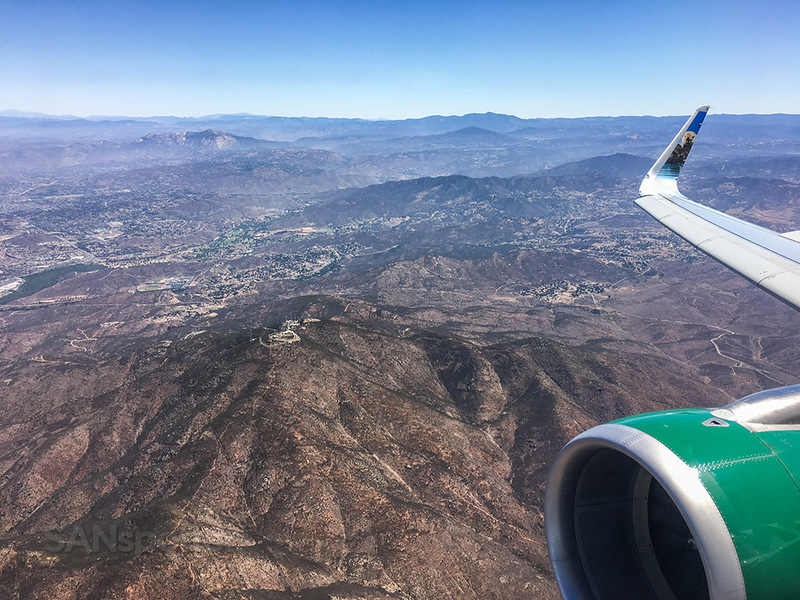 The aviation industry has come along way since they days of piston-driven aircraft however, and I doubt that things would be this calm if we were bouncing around on a DC3 on our 12-hour / 5-stop route west to San Diego this morning. Another nice thing about modern aviation? 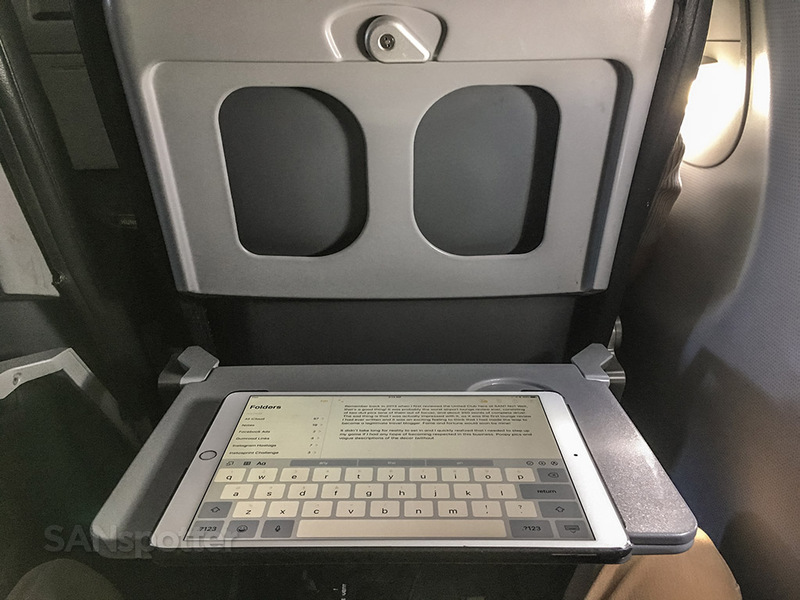 If this were a DC3, that iPad would be a 30 pound typewriter and you’d be hating life (and annoying all of your fellow passengers) as you worked on your trip report. 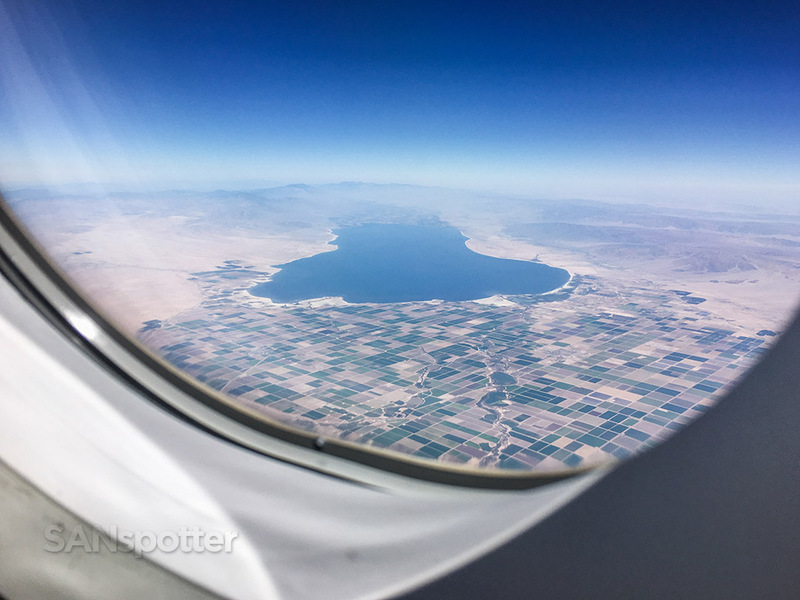 The Salton Sea! She looks good from the air, but I assure you it is the stinkiest Sea that you will ever encounter. Think twice before hopping in a car and road-tripping to see it up close! 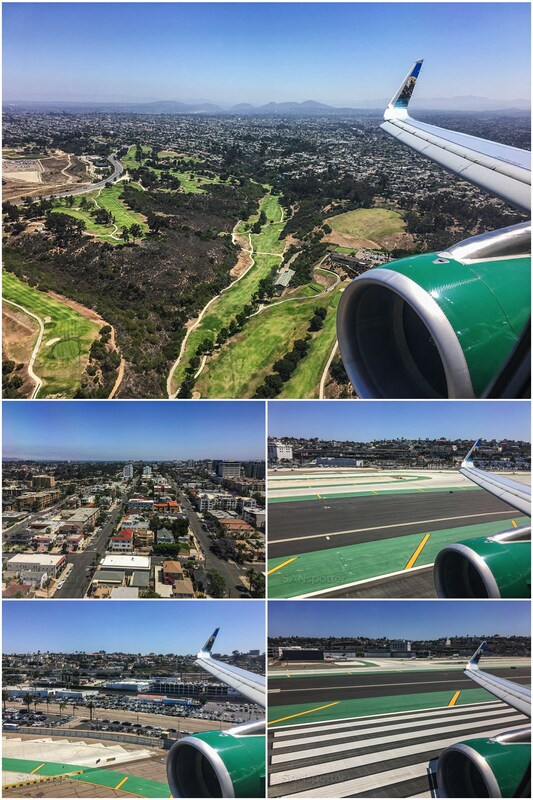 Pike enjoying the heck out of our glide around the mountains and into San Diego. The humans inside the cabin couldn’t care less. There are two ultra low cost airlines in this pic, and I don’t know about you, but I think I am seated in my favorite one right now. I can’t say the same thing about this pic unfortunately. 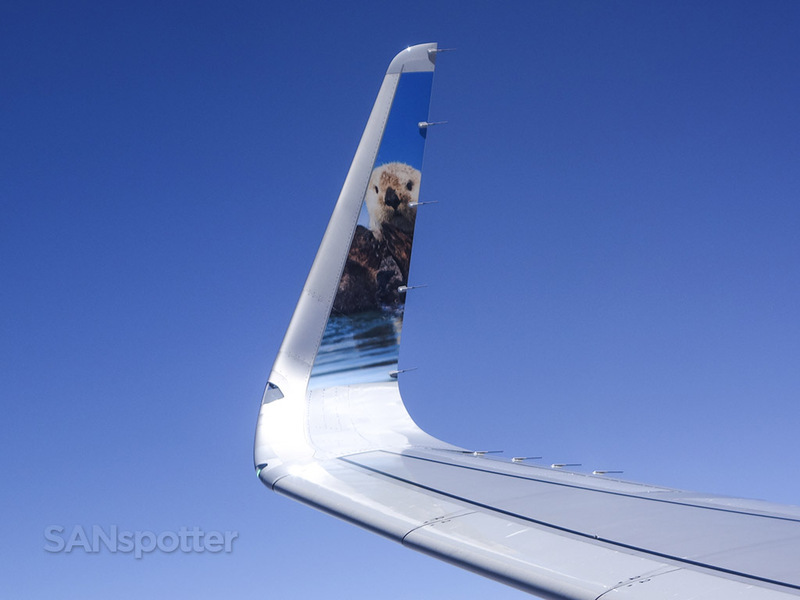 There’s just too much to love about Alaska airlines IMHO, and I would have a really hard time deciding between Otters and Eskimos. 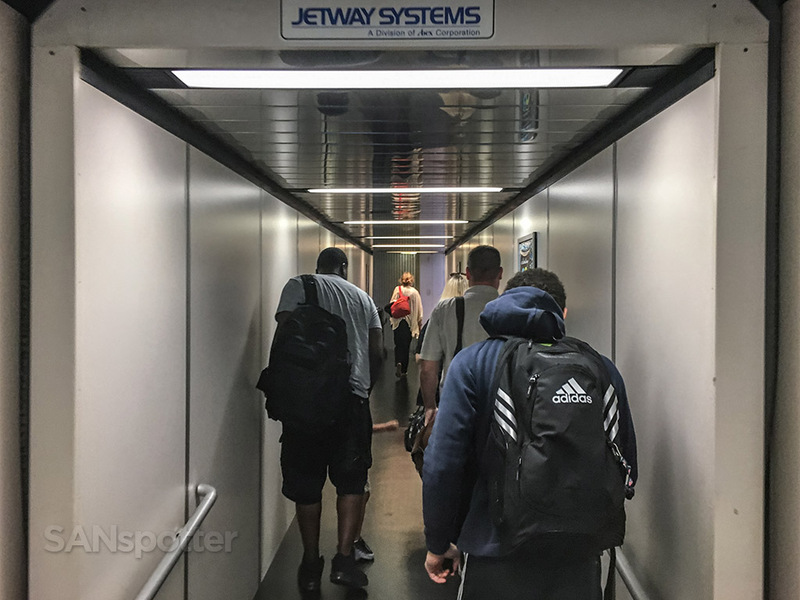 My opinion on jet bridges is very clear, however. I didn’t mention it earlier, but that super long jet bridge at AUS gave me the willies (claustrophobia like crazy! 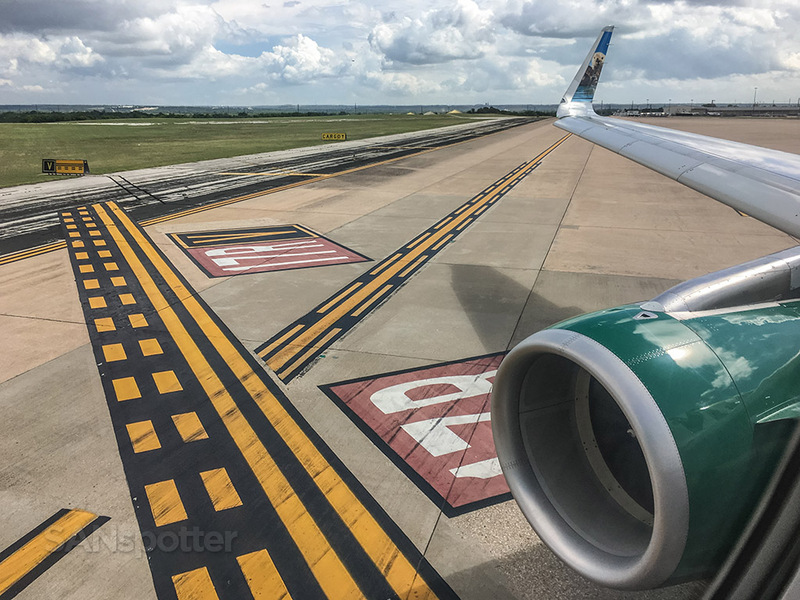 ), so short jet bridges like this one makes it a lot easier for me to stay calm like a super-cool seasoned traveler walking off yet another airplane from some far off corner of the globe Austin, TX. And there you have it. 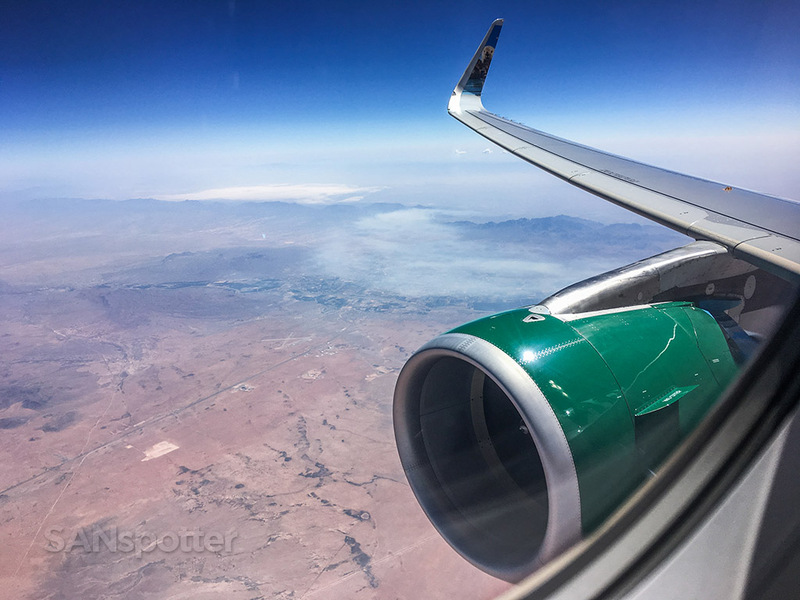 We have reached the end of this Frontier Airlines trip report series, which ended up being a rather pleasant experience when I take a giant step back and reflect on it from afar. 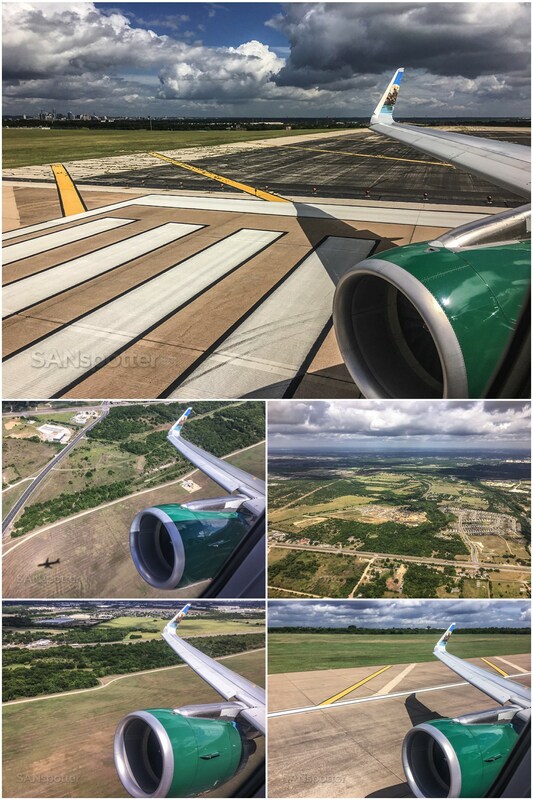 It was the first time that I had flown Frontier Airlines in years (the last time was back in June of 2015), and these two flights were painless and easy – so painless and easy in fact, that I’m actually looking forward to flying with Frontier again in the very near future if I can make it fit into my schedule. Oh wait – was that another valuable life lesson worth jotting down? 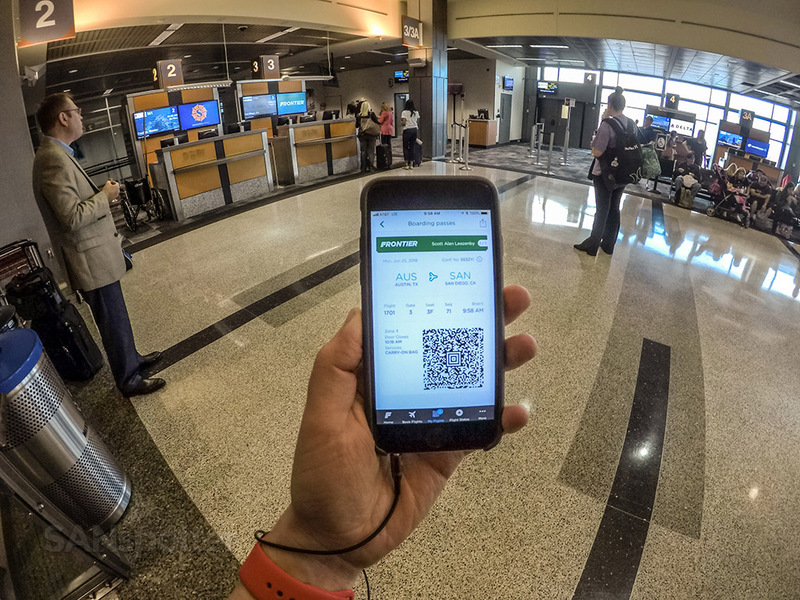 Holy crap – that’s two in one post and I hope you haven’t run out of paper! Thanks Geoff! Yeah, I’ve got all the equipment for it (mic, software, etc) , and the sarcasm (lol), but the only thing left to figure out is what to actually talk about! Dang it, you’re right!! Thanks for pointing that out, because I completely missed it for some reason. I guess I naturally assumed that it was a NEO because the interior was exactly the same as the other one, but I have no excuse for not even noticing the smaller engines. Thanks again – post updated with the correct info! 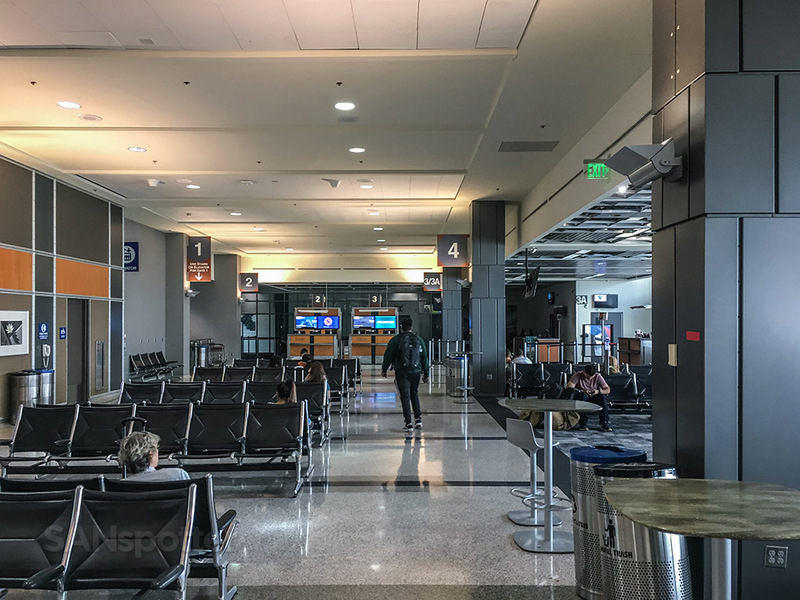 The intent of the South Terminal was to relocate all of the ULCCs there, since it’s not nearly as nice as the main terminal. Frontier was originally supposed to move, and that may still be in their plans I’m not sure. Definitely the source of the driver’s confusion though. Interesting. 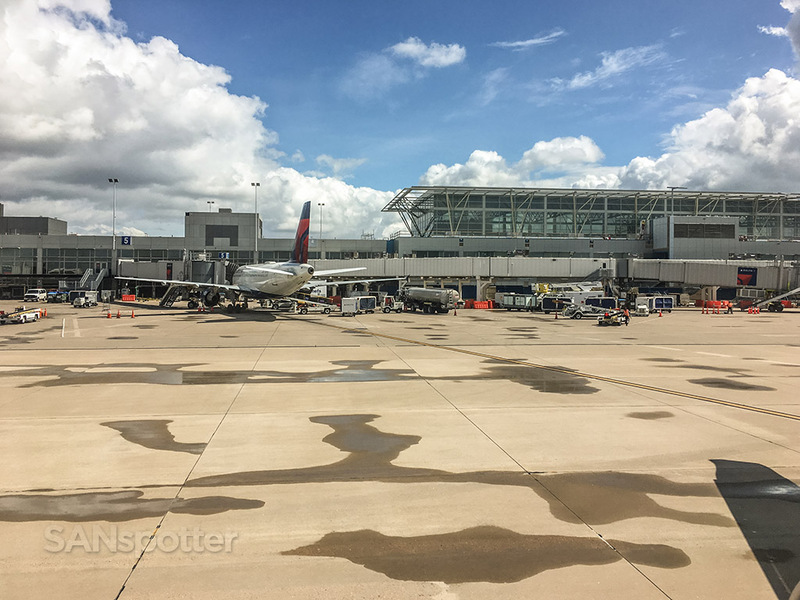 I noticed a lot of construction going on while I was there, and with the South terminal looking so “temporary”, I was thinking that maybe a new terminal was being built to replace it? Maybe what I saw was just parking garage construction or something. Either way, the South terminal didn’t look very nice IMHO.